They can’t afford to let him sit out, if he does that defense doesn’t look nearly as scary granted their DBs aren’t gonna scare anyone. Without Clowney it becomes a lot easier to stop Watt. Just MO, but I think Clowney could both be good somewhere else, and Texans can still have good defense if they reallocate that money..
Just been too much dependence on him and Watt, who have both been in an out of the lineup with a bevy of injuries. Trade him. Long term risk. Get what you can get. Move on. I think we need a LT and top CB more than we need Clowney and someone might be willing to provide both in exchange. 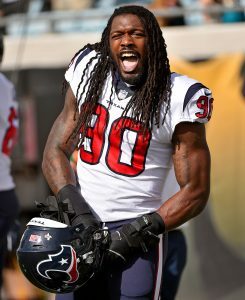 I would hate to be the guy to hand over a $100MM contract to Clowney. He has no love for the game. Take his money and be an Albert Haynesworth.